The CH-53K in flight testing. Teamsters Local Union 1150 voted by a 15-1 margin Sunday for concessions sought by Lockheed Martin as part of an incentives deal with the state that will keep its Sikorsky Aircraft subsidiary and production of its next generation of helicopters in Connecticut, state officials said. The General Assembly voted overwhelmingly last month for a package of incentives that could give Lockheed as much as $220 million over 14 years if it meets goals for hiring, capital investments, payroll increases and supply-chain purchases. 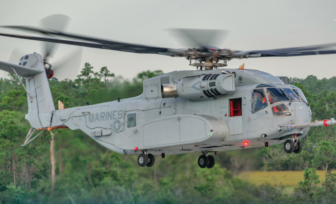 The production of the CH-53K King Stallion heavy lift helicopter is projected to mean $69.2 billion for the Connecticut economy. The Teamsters vote was 2,104 to 140, according to legislative leaders. Teamsters officials could not be reached for comment, but the deal approved Sunday reportedly will cut the pay and retirement benefits of future employees. The state deal provides $5.7 million in annual sales tax exemptions, up to $80 million over the life of the deal, and $8.57 million in annual grants, up to a total of $140 million. The grants will be financed by $140 million in borrowing, beginning in 2020. The borrowing carries an estimated interest cost of $30 million. Even with the incentives and new production, Sikorsky’s current employment of 7,855 is projected to drop to 6,582 over the next six years, based on dwindling orders for the Black Hawk, an Army helicopter. The deal calls for employment to exceed 7,200 in 2024 and top 8,000 in 2032.